Now that Maxis has finally revamped its MaxisONE postpaid plans to offer more data than before while maintaining the same unlimited calls and SMS to all networks, how does it compare to the rest of the postpaid plans in the market? 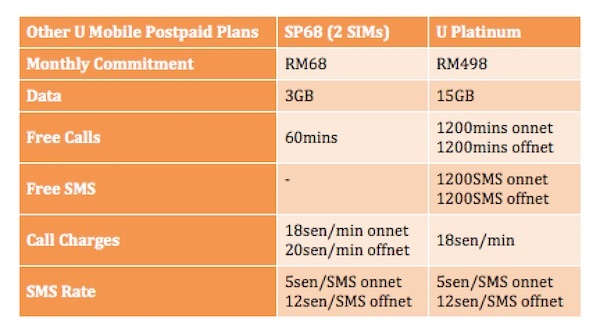 Here’s an updated list of postpaid plans offered in Malaysia by the four major telcos in the country – Maxis, Celcom, Digi and U Mobile. With the new MaxisGO postpaid plan that was quietly unveiled last month, and the enhanced MaxisONE plans that were launched just last week, the telco now has 6 main postpaid plans – SurfMore 50, MaxisGO, and MaxisONE 98/128/158/188. 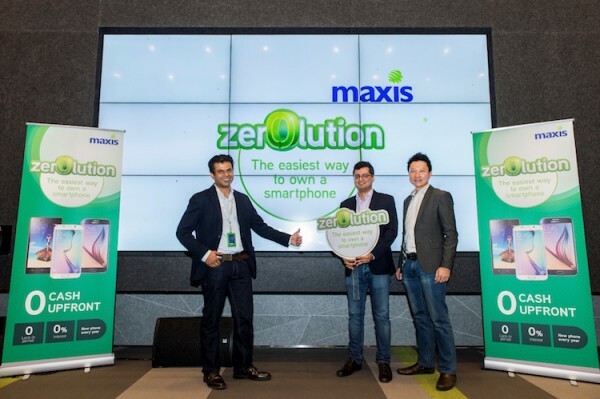 Apart from the monthly charges and data, calls and SMS bundled into the plans, Maxis also offers other benefits. MaxisGO for example comes with 1GB of additional off-peak data for use between 2am and 7am every day. That may not be a lot, but if you have something you need to download overnight, you can make use of that allocation. SurfMore 50 has pretty affordable data add-on rates at RM15 for 1GB. This is half the price of the data add-on for rest of the plans offered by Maxis. Sadly though, not only does it not come with any free calls/SMS, the pay per use charges for calls and SMS are quite expensive at 20sen/min and 15sen/SMS for usage made to all networks. As the main postpaid plans from the telco, the MaxisONE plans come with the most benefits. Maxis offers free Spotify premium subscription for its MaxisONE plan subscribers, and with no data charges for streaming on the service. This means that you can enjoy your favourite tracks while you’re on the go without consuming up your data quota. MaxisONE plans also come with unlimited social chats on chat apps such as Line, WeChat, WhatsApp and Facebook Messenger. You can still chat after you’ve used up your high-speed quota, but the speed of sending or receiving images and videos through social chat apps may be affected during these instances. Finally, MaxisONE plan subscribers can also opt for the new Maxis Zerolution and walk home with a brand new phone with zero upfront, zero interest, and “zero 24 months contract”. Celcom’s super affordable First Basic 38 plan promotion may be over now, but thankfully, the telco is always introducing new promotions to keep its plans affordable. They currently have an on-going Merdeka promotion that offers 3GB of data, and free calls & SMS for only RM48 a month. Its regular plans with Optimiser – First Basic 85 and two SIM First Elite, are still available for those who use more data, calls and SMS. Celcom has a rather unique approach to its plans with Optimiser. With Optimiser, once you use up the allocated data/calls & SMS, Celcom will automatically allocate you with more depending on which gets used up first. If you use up your 2GB of data for First Basic 85, you will get an additional 3GB to be used for the rest of the month. Likewise, if you finish the 100 mins + 100 SMS first, you will get an additional 600 mins + 600 SMS. Celcom First Elite’s Optimiser is similar to the First Basic 85. It comes with two SIM cards, each with their own free calls and SMS, and data, but Optimiser is only available for one SIM card. First Elite also comes with priority services from Celcom known as First Assist. The privileges change from time to time, so you can follow Celcom to keep yourself updated with the latest offerings. Celcom’s add-on data (Max Up/Max Up All) is also among the most affordable in the market. Get 1GB for only RM15, or 5GB for RM50. 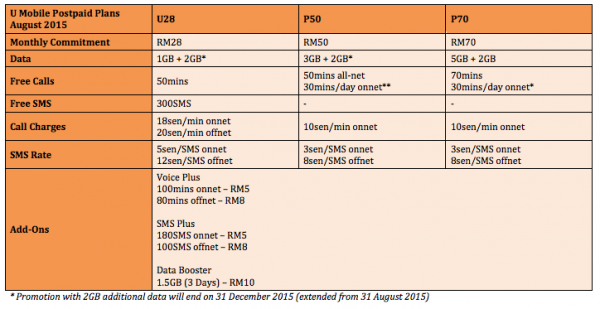 Data add-on prices are standard for all postpaid plans offered by Celcom. The First Basic 85 and First Elite plans come with Max Up All, a feature that gives you additional calls, SMS and data for RM50 a month. For those who wish to sign up for the Celcom First One Plan Merdeka offer that gives you a rebate of RM20 every month (the price of the plan used to be RM68), you better do it soon because the offer will end on 31 August 2015. Digi has split its postpaid plans to serve two different type of users – those who use a lot of data (High Data), or those who use a lot of calls and SMS (High Voice). There are five different plans ranging from RM50 a month all the way to RM238 a month. Digi’s plans have always been one of the most straightforward. Everything is listed out properly so you can easily pick a plan that is suitable for you. In addition to calls & SMS, and data, the plans offered by Digi also comes with other benefits such as free storage on Capture (cloud storage service), free unlimited WhatsApp and WeChat, free Facebook, and free Music Freedom. However, these additional benefits are limited to selected plans only. Free Capture storage is available for all plans, free WeChat/WhatsApp/Music Freedom are available for SmartPlan 78 and above, and free Facebook is available for SmartPlan 108 and above. U Mobile definitely has the most competitive plans in the market. As the smallest player among the four major telcos in Malaysia, it has been very, very aggressive with their prices. The latest promotion that offers 3GB of data and free calls & SMS for only RM28 a month has definitely attracted a lot of attention. That’s not all though, U Mobile also has other postpaid plans – Ultimate Device and U Platinum (for device bundles), and Internet Share Plan. In terms of additional benefits, U Mobile does not have as much features as what the Big Three telcos are offering. The most attractive is definitely the free 50MB of data roaming to selected countries. For those who own multiple devices, you can also share your calls, SMS and data with up to three SIMs with the P50 and P70, and Ultimate Device. The Internet Share Plan also offers similar benefits, it comes with two SIMs, and the third is charged at RM10/SIM/month. As mentioned before, while the price and offerings play an important role, the most important factor to consider when picking a postpaid plan is in coverage – there’s no point in signing up for a cheap plan when it has no service in the area you live in. This is especially vital for those who want to sign up for a contract because two years without proper service is a long time to suffer wait. Hence, you should check the 2G, 3G and 4G coverage for each telco at their individual pages before jumping into any postpaid plans – Celcom coverage area, Maxis coverage area, DiGi coverage area and U Mobile coverage area. Once you’ve sorted that out and then refer to this guide, you should now be better equipped to make the most informed decision on which postpaid plan to subscribe.